I have written before about the book The Memory Illusion. In essence lawyers need to be concerned about how easy it is for false memories to be created and how fallible the human memory is. The creation of an inaccurate account can sometimes be done at an early stage by inappropriate interviewing, albeit with the best of intentions. The author of that book, Dr Julia Shaw, is involved in an interesting development that could have far-reaching consequences. She is part of the team that created “Spot”. This aims to help create an accurate, and hopefully contemporaneous, record of inappropriate conduct at work. Spot is a device whereby someone who wants to record, or report, inappropriate behaviour at work. This is done by an anonymous online written conversation with a bot. This is programmed to respond to what is written and ask meaningful, but non-judgmental and non-leading follow-up questions. Spot is not a person. No human ever reads the conversation (unless asked to do so). The designers of Spot, explain their use of a bot. It’ll never judge or assess you. It’s available anytime, anywhere, for as long as you need. The designers clearly have the need to obtain good quality, contemporaneous evidence, clearly in mind. “There are 3 main steps to record and report your experience with Spot. Interview with Spot. Spot asks a series of questions about what you remember. You can answer or skip any question. The chat takes as little as 10 minutes or as long as you need. View the confidential record of your interview. Email yourself a link to download this timestamped document and keep it safe. It can be used as high-quality evidence if you need it. The Spot reports are PDFs that are securely signed and timestamped. Each has a unique ID number. With a memory scientist involved there is clearly great stress on obtaining accurate information. “What evidence is Spot based on? Spot was designed to ask the same questions as a highly trained memory interviewer. All questions are based on a standard protocol called the Cognitive Interview. What is the Cognitive Interview? The Cognitive Interview was developed by scientists to help police reliably extract accounts of important life events. Decades of research show that this technique increases the amount of accurate information and decreases the amount of inaccurate information obtained in an interview. The Cognitive Interview is currently considered best practice for interviewing people about negative emotional memories. How does the Cognitive Interview work? The Cognitive Interview works by first asking you to freely describe what happened, followed by specific questions called ‘probes’ that ask you about the things you mentioned. Part of what makes this technique effective is the way in which the questions are asked. All questions are open-ended rather than leading the person to a certain response. It takes substantial knowledge to create a high-quality set of questions. Does the Cognitive Interview know whether my memories are accurate? No. The Cognitive Interview cannot tell you whether any particular memory is accurate. However, it does encourage you to recall more information and avoids the common mistakes made by human interviewers. The importance of early, and accurate, witness gathering has been stressed many times on this blog. This is an important development in relation to the collection of evidence in circumstances that can be extremely difficult by conventional means. There is a distinct possibility that a judge will prefer evidence gathered by this method to “conventional” statements taken many months, or years, after the event. The Frequently Asked Questions page is here. I gave it a try to see how it would handle some basic scenarios that come up in Employment Tribunal litigation. I wasn’t impressed. It just asked the basic “what happened in your own words”, “when, where, who and witnesses” questions. There didn’t appear to be any significant follow-up questions despite the obvious holes in what I claimed and forensic inadequacy of the answers I gave to the questions. For example I typed in “I was harassed” in one situation, and “I was discriminated against” in another. It didn’t pick up on the obvious point that those are legal labels not factual allegations, and failed to ask any follow-up questions for specifics of what I meant by those terms. It’s a common problem in employment litigation and HR investigations, and I’d expect software of this kind to respond to the entry of legal jargon with “what do you mean by legal term x” just as any competent HR officer or lawyer would. It also doesn’t show any real forensic nous. It puts out some bland statements about preserving evidence etc., but when it asks you whether you’ve told anyone else about the incident, it doesn’t ask the obvious follow-up question if your answer is “no”: “why not?”. I also asked for clarification to a question, and rather than answering my query it just moved onto the next question. In short, it does not appear to ask any meaningful probing questions as follow-up. 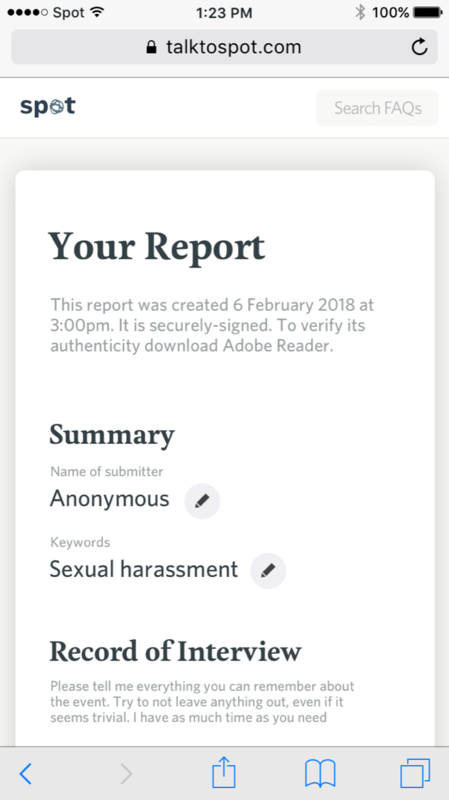 From what I saw when I used it does not appear to be much more than a form with an open question asking you to set out “what happened”, “who did it”, “when” and “how did you feel about that?”. That is functionally little different to the claim form already used in Employment Tribunal litigation. I don’t see how it is realistically any better than emailing yourself, raising a grievance, going to the CAB or ACAS, or the existing ET1 process, and several ways in which it could be worse because of the false sense that it has somehow created a forensically adequate record despite its inability to detect and address the gaps in the evidence. I think, in part, you are doing what all we lawyers do and immediately seeking to fit a series of facts into legal labels. This is new (and it admits to being experimental) territory. The questions are deliberately open-ended so as not to “impose” a recollection. As lawyers we are fond of “follow up” questions and asking “why not”. This does not always produce the best evidence for trial. The crucial thing here is that it is contemporary and non-judgemental. However I am sure wiser people than me can respond. But the problem is that employee complaints frequently start with the legal labels without setting out the factual basis for that claim. There are plenty of claim forms and grievances that, for example, say “person X harassed/bullied me” without saying what person X actually did. The reason I typed in with those particular phrases was because I see a fair number of claims and grievances that are set out that way and I wanted to see if the software would be able to address it. I don’t see that it is imposing a recollection or contaminating the evidence to get the person to say “what do you mean by ‘harassed'”, but a necessary step in ensuring that the employee records factual evidence rather than stating an opinion. I’m also unclear why it would be evidentially damaging to ask an employee why they have not raised the matter with anyone else or, to put it more neutrally, why they have chosen to report online as opposed to elsewhere. It is a question that will almost inevitably be raised in cross examination and is best answered by a contemporaneous record of the reason why they chose the route they did.